The night before, spray a 9 by 13-inch baking pan with cooking spray. Slice one whole wheat baguette (about 18″ long) and cut it into 1-inch cubes. Arrange the bread cubes in a single layer in the baking pan. Pour the egg mixture over the bread in the pan, spreading it around so the liquid saturates the bread. Scatter 2 c. fresh blueberries evenly on top. (If using frozen berries, don’t add them or the almond/brown sugar mix below until the next morning just before baking, as frozen berries tend to ‘bleed’ all over the place if you add them the night before). Cover tightly and refrigerate pan overnight. Next morning, preheat the oven to 350 degrees F.
Uncover the baking pan and bake for 40 to 50 minutes. Serve warm from the oven (best!) or at room temperature with a big dollop of low-fat vanilla yogurt or low-fat sour cream (our preferred family favourite!) and drizzle lightly with more Canadian maple syrup. Does anybody have nutrition information on this lovely meal? Specifically carbohydrates and calories per serving. Thanks! Hi Celia – I’d say approx 300 calories per serving and about 40 g carbs – very rough estimate. I tried this recipe the other morning and it was absolutely delicious. My kids even wanted seconds so that alone tells me this recipe is a hit. Mmmmm Mmmm Good! Last weekend for brunch, I tried this recipe substituting frozen raspberries instead of blueberries. As directed, I added them just before putting the pan into the oven on Sunday morning so the red berries wouldn’t ‘bleed’ into the bread/egg mix. WOW! This was SO good. We served it with low-fat sour cream and some real maple syrup (which may sound odd but like you, it’s a family tradition with pancakes); the combination of the sweet syrup and the bite of the not-sweet sour cream is dynamite. Thanks for this heart-smart recipe – it’s destined to become a brunch favorite in our kitchen, possibly with blueberries or other mixed berries next time. Hello – I found this on ask.com. Very useful articles for good recipes on your website! 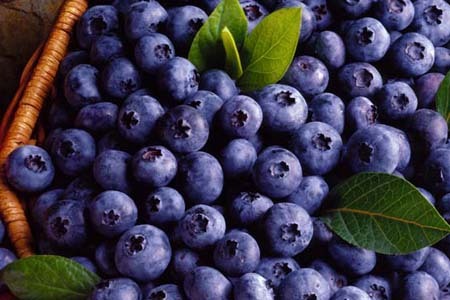 I have always loved blueberries!!! My favorite blueberry treat is blueberry cheesecake, but your blueberry almond French toast sounds delicious!!! I will definitely try your recipe. Thanks for sharing!!! Great! Loved this inspiration and will definitely try this one out.